Sage pays close attention to what your business demands. 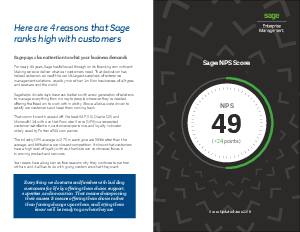 For nearly 40 years, Sage has followed through on its founding commitment: Making sure we deliver what our customers need. That dedication has helped us become one of the world’s largest suppliers of enterprise management solutions, used by more than 3 million businesses of all types and sizes around the world. Sage helps drive today’s business builders with a new generation of solutions to manage everything from money to people wherever they’re needed, offering the freedom to work with mobility. Above all else, we’re driven to satisfy our customers and keep them coming back. That commitment has paid off. We beat SAP (19), Oracle (25) and Microsoft (34) with our Net Promoter Score (NPS)—a respected customer-satisfaction, customer-experience, and loyalty indicator widely used by Fortune 500 companies. The industry NPS average is 31.75, meaning we are 58% better than the average, and 88% above our closest competition. It shows that customers have a high level of loyalty with us, thanks to our continuous focus in improving product and services. Your peers have also given us four reasons why they continue to partner with us, and it all has to do with giving customers what they want.